Almost certainly to the displeasure of mainstream Brussels, leaders of Europe’s far-right parties came together on the French Riviera this week, saying they wanted to devise a battle plan for next year’s European election. The timing – 1 May, or Labour Day – was no coincidence. Some of the leaders who came to Nice denounced the ‘resurgence of neo-Marxism’ as a threat to Europe. 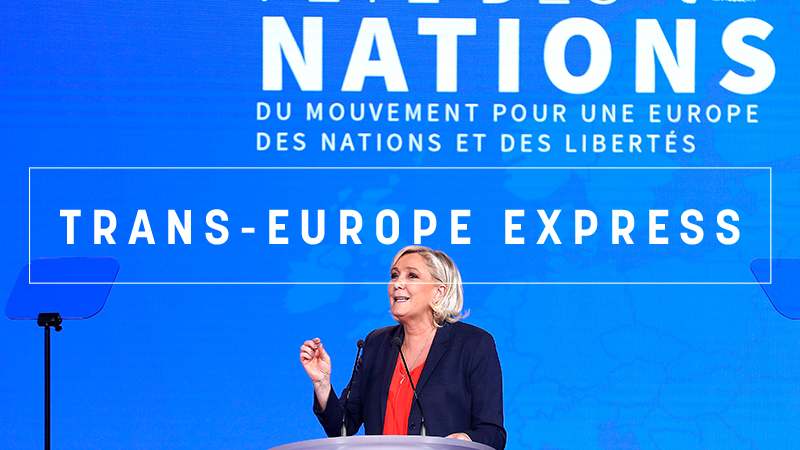 The far-right anti-immigrant Eurosceptics are a motley crew but the nativist veteran Marine Le Pen has managed to bring East and West together, rallying behind slogans like ‘multiculturalism is failing’ and ‘time to change Europe’. The rally was organised under the banner of the ENF (Europe of Nations and Freedom), a small faction in the European Parliament. Still, there were some notable absences that must have made Le Pen grind her teeth in disappointment: Italy’s Lega Nord leader Matteo Salvini was scheduled to appear but only sent a video message of support. Dutch politician Geert Wilders, also stayed away. But there were plenty of others who took part. Vesselin Mareshki, leader of Bulgaria’s “Volya” party, which has 11 MPs in the national parliament, was one of them. A day after returning home, he announced in an interview on the Bulgarian national radio that his force would campaign for a referendum for Bulgaria to leave NATO. “This will be one of our big initiatives in the campaign for the European elections. We believe that NATO doesn’t actually give us anything, but that it is robbing us instead,” Mareshki said. He added that NATO commitments required Bulgaria to “take several billion from the Bulgarian people” and invest them in “meaningless piles of metal”. According to Mareshki, EU membership has also been detrimental to the Bulgarian people. “They banned the construction of a new nuclear power plant, they made us shut down our [nuclear] reactors, they did not allow us to participate in South Stream, at the same time they are building Nord Stream, Turkish Stream and all other streams”, he said. From the Czech Republic came Tomio Okamura, leader of the far-right group SPD (Freedom and Direct Democracy). SPD has already called for the country to quit the EU and has been pushing for a referendum similar to the Brexit vote in the UK in 2016. Okamura, like Le Pen, is seeking allies for the European elections and aims to build a coalition against what he calls an ‘EU diktat´. He stresses the importance of breaking free from the omnipotent rule of the EU Commission and Brussels affiliates in order to dissolve the EU from within and restructure it into a Union of European states, whilst preserving the four freedoms and interstate cooperation. In his speech in Nice, Okamura slammed the centrist direction of the EU, headed by Commission President Juncker and the leaders of the Franco-German axis, Emmanuel Macron and Angela Merkel. It would be easy to dismiss these comments as marginal if the far-right had not made inroads into mainstream politics in the last few years. In Germany, the anti-immigration AfD got almost 13% of the vote in September’s election. In Italy, Salvini’s Lega won the most seats in the inconclusive March ballot. Leaders of Poland and Hungary declare themselves as centre-right but share many anti-immigrant and Eurosceptic views with ENF parties. The pro-European camp should take heart from the fact that none of them came to Nice but there is no room for complacency. It remains to be seen if Europe’s economic recovery, the end of roaming and free Interrail passes for the young will be enough to stave off the challenge and keep the next European Parliament firmly in the hands of pro-European forces. Georgi Gotev, Ama Lorenz and Artur Mundil contributed to this story. This edition of Trans-Europe Express is co-financed by the European Parliament. Booze move. After years of legal blocks, Scotland introduced minimum pricing for alcohol. Meanwhile, the whisky industry, which is lucrative to the country’s economy, worries that this will mean losses. Back to the game? In France, Marine Le Pen led a rally of Europe’s far-right to celebrate recent gains on the continent and devise a battle plan for next year’s European elections. Overcoming fears. Poland has not accepted any refugees under the EU’s relocation and resettlement programme. A new project tries to overcome stereotypes. Ending limbo? Raising hopes for an end to months of political instability, the Czech Republic could be days away from getting a new coalition government. Under fire. A Slovak public broadcaster came under attack after sacking four reporters who had signed an open letter warning of creeping political pressure in state media. Ridesharing. As Europe looks for models to facilitate a peaceful coexistence between taxi drivers and new ride-sharing platforms, Estonia offers a neat solution. Not amused. Bulgaria dislikes the major innovation in the next long-term EU budget proposed by the European Commission to link EU funding to rule of law. Deep wounds. Italy is facing the challenge to overcome deep-rooted hostility built up over years as the anti-establishment 5-Star Movement and the centre-left Democratic Party are to strike a deal to form a government and end the post-election stalemate. Taking initiative. Spain wants to become the next major player defending European shores as Europe’s naval power Britain is at the EU’s exit door. Strengthening ties. According to a new poll, most Swiss support the government’s plan to forge a new treaty with the EU that would have arbitration panels to help settle disputes. Welcoming efforts. If Macedonia’s efforts to resolve a decades-old name dispute with Greece come to a positive result, the Balkan country has the prospect of joining the EU and NATO.